A small boat carrying migrants has overturned Guinea-Bissau, a port official said, adding that the ship may have had more than 60 people on board when it was launched. Governor Siga Batista said the pirogue, a narrow wooden fishing boat, sunk on Monday night from the poor country of West Africa, which has 200 km of coastline and does not patrol ships to save lives on the high seas. "An overloaded fireman, carrying illegal immigrants, was overthrown in our waters," said Batista by phone, saying the fisheries watchdog had warned him of the disaster. 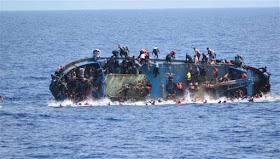 "We do not know how many people were on board when the boat was sunk, their identity or even their nationality. But according to the information I reached, more than 60 people were on board," added Batista. No survivors have been found, but local radio stations have asked fishermen to inform the authorities if they find live organisms or passengers. "Because of the economic situation, we have struggled to organize a rescue operation," said Batista.